The Governor of Benue State, Samuel Ortom has described the allegation coming from the camp of the All Progressives Congress, APC, that he sponsored a smear campaign against him, as unfair. The governorship candidate of the APC in the state, Emmanuel Jime, had accused the governor of being behind the outcry that greeted APC rally in Daudu IDPs camp in the state. 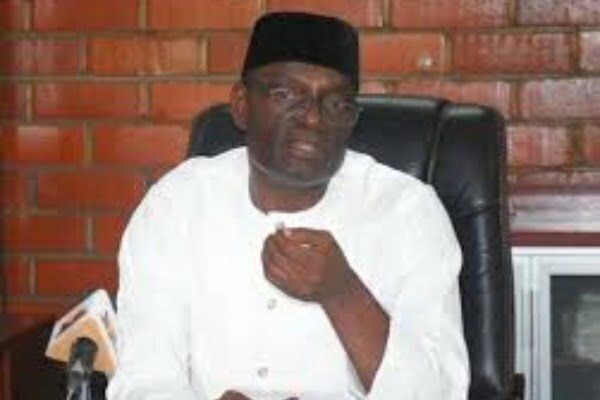 But in statement made available to DAILY POST by the State Government on Monday, Terver Akase, the Chief Press Secretary to the Governor, said â€œWe read newspaper reports credited to the governorship candidate of the All Progressives Congress, APC in Benue State, Emmanuel Jime, in which he alleged that Governor Samuel Ortom sponsored a smear campaign against him. â€œMr Jimeâ€™s allegation that Governor Ortom was behind the public outcry that greeted APCâ€™s rally in the Daudu camp for Internally Displaced Persons, IDPs is a clear case of misplaced aggression. â€œThe Governor was not part of the APC meeting where the decision to stage a political rally in an IDP camp was made. He also did not determine how the public viewed with widespread condemnation, the APC outing in the camp including the reported purchase of permanent voterâ€™s cards, PVCs from the vulnerable IDPs. The APC governorship candidate was, therefore, being unfair in his accusation of Governor Ortom over the Daudu IDP Camp incident. â€œMr. Jimeâ€™s allegation that the Ortom administration is also behind the story going round that his mother is of Fulani ethnic group is another unfair accusation. He cannot provide any evidence to prove that Governor Ortom insinuated that his mother is a Fulani woman. We urge the former lawmaker to look elsewhere for the origin of the rumour and spare the Governor of these many accusations. â€œOn the interest shown in his candidacy by Miyetti Allah groups, Mr Jime is wrong again to accuse Governor Ortom. It is on record that the Fulani Nationality Movement, FUNAM, one of the violent groups which claimed responsibility for the 2018 Benue killings and threatened to cause more bloodshed in the state has vowed that it will do all within its power to remove Governor Ortom from office and ensure that Mr Jime is made Governor of Benue State. â€œA few days before FUNAM issued their threat, another group known as APC Fulani Nationwide, led by one Garus Gololo had lavishly endorsed Mr Jime as its preferred governorship candidate and promised to mobilize their members across the country to support the election bid of the APC candidate in Benue. â€œWe wonder how Mr. Jime considers those endorsements, goodwill and support from the Miyetti Allah groups which were extensively publicised by the media as emanating from Governor Ortom. â€œWe found Mr Jimeâ€™s comments that the Ortom administration lacks courage as uncharitable, to say the least. â€œGovernor Ortom may not have the strength of a pugilist to engage his opponents in fisticuffs at official functions but he surely does not lack the strength of character of a good leader who does not abandon his people when the enemy comes knocking. â€œHe has demonstrated uncommon courage in defending his people against the same violent groups who are today endorsing Mr Jime for Governor so that he can win and pander to their whims and caprices. â€œMany also wonder why they did not hear his voice on the 2018 New Year Day and other massacres in Benue State as well as his decisiveness in choosing a running mate, two months after the APC governorship primary election. â€œWe urge Mr Jime to heed his own advice and focus on campaign of issues. Thatâ€™s the only way democracy can be deepened for the people to decide who has what it takes to lead them. â€œThe APC governorship candidate does not need to embark on a voyage of accusations against opponents.